Is there a forced win on a 10x10 board? Let's assume the 50 move rule doesn't apply. Actually, the bishop and knight mate is not as slippery as it appears. I have checked this on a tablebase program I wrote. On a 10x10 board, the side with the bishop and knight (say white) can force mate in at most 47 moves. White can even force mate on a 16x16 board, in at most 93 moves. I believe mate can be forced on an arbitrarily large even size board. First, on an odd size board, I've confirmed that white cannot force mate if the bishop is on the wrong color. Mate can only be forced in a good corner (one that the bishop controls), so if there are no good corners, mate cannot be forced. After 23. 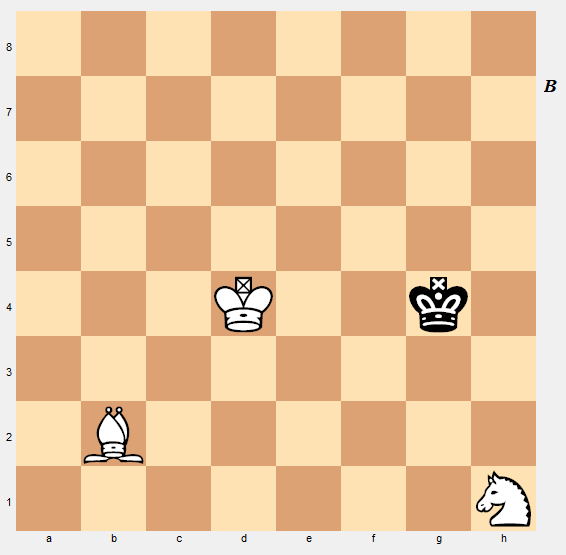 Nf2, we have a position just like the one shown in Andrew's answer (but upside down: W: Kg3, Bj2, Nf2; B: Ke2). If we make this board 8x8 by removing the a and b columns (and rows 9 and 10), it would be mate in 14, but here it's mate in 25. 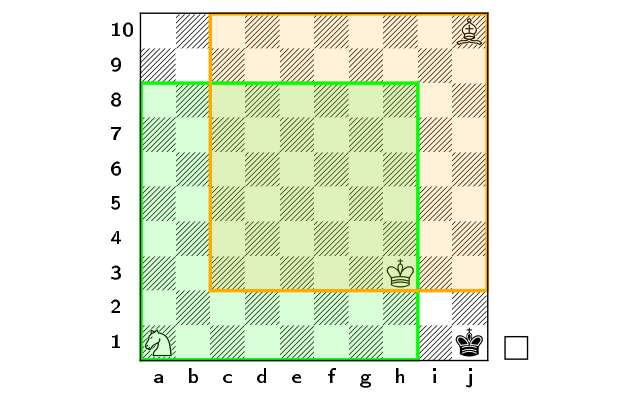 In the optimal line above, the black king never really tries to escape towards the a10 corner. Let's say he does, with 23. ... Kd2 24. Bf6 Kc2. This move shortens the mate by one move, with the continuation 25.Kf3 Kb3 26.Ke4 Ka4 27.Kd5 Kb5 28.Bd4 Ka4 29.Kc4 Ka5 30.Kc5 Ka6 31.Kc6. Here is the number of moves to force mate on every even sized board from 4 to 16. 4: 15; 6: 22; 8: 33; 10: 47; 12: 64; 14: 78; 16: 93. Note that on any size board there are a handful of positions that are drawn because black can win a piece immediately. It is long, but playing through it definitely helped convince me that white could force mate on an arbitrarily large board. In the first phase, the white king and bishop can corral the black king while buying tempi for the white knight to catch up. Once the black king is trapped in the bad corner (a16 in this case), it is shuffled down the a-file with very little breathing room. Although the procedure is significantly more complicated than a W maneuver, white appears to always be in complete control. Is there a forced win on a 7x7 board, with a bishop of the 'wrong' colour? The key point is that it is not possible for white to force this position. Black's king would have been stalemated on the previous move. Alternatively, if black's king is moved one square to the left, the only legal move that white could have just played would be to move the bishop onto that diagonal, delivering mate. If this were the case, where was black's king before that? It would have been on f2 (two to the left, one up). So black was not forced to move into the corner and could have instead avoided the mate. To conclude, there is no way to force mate in the wrong corner, shortening the board doesn't change this fact. Black usually plays ...Kc6 and then after Bd3! the king has no escape. On a 10x10 board, however, black could play ...Kb7 followed by ...Ka7 and finally ...Kz6 (let's call the first file to the left "z"). 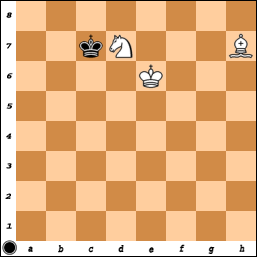 White has no way to get the king and knight over to help prevent the black king from escaping the bind. So again, it's a good thing that the board is only 8x8 otherwise the bishop and knight would never get to mate the king! 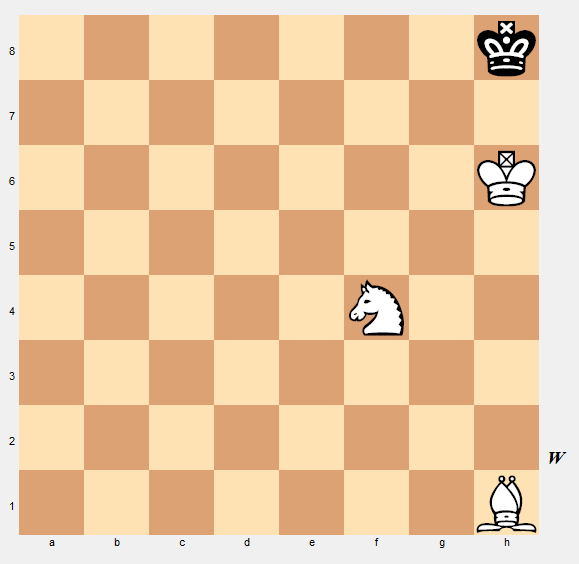 There are obviously many forced wins on any boards where M and N are at least 8 (including M or N or both infinite) so long as there is a corner of the same colour as the bishop's square. If the pieces are all in the yellow tinted sub-board and the black king cannot escape the d10-j4-j10 triangle, the the position is also won on the full board, because such positions can be (optimally) won on that sub-board without letting the black king escape the triangle. Similarly for the green sub-board. The same applies on an MxN board. But the won positions are by no means restricted to such positions. In the position shown, for example, White can mate in at most 33 moves against any Black defence. There is, of course, a significant percentage of similar positions. There are not necessarily forced wins if M and or N are too small. For example there are no checkmate positions on a 1xN board. There are no wins on a board that includes no corners, i.e. where one or both sides extend indefinitely in both directions. Drawn positions are the exception on the standard board (less than 10% of all positions according to the Nalimov EGTB). But I believe that on a 10x10 board there are also draws by repetition, where the lone king cannot force the capture of a piece, but the side with the pieces also cannot force mate. I think this becomes the general case for large M and N as it obviously is for odd M and N with the "wrong" coloured bishop. So long as the board contains a corner of the same colour as the bishop's square and M or N remains at 8 or less (but is not too small) mate will still be forcible generally for finite large values of the other and (somewhat irrelevantly) in as many positions as not for an infinite value of the other. After reading DanStronger's post I think my comments on draws by repetition on larger boards are erroneous. These were based on a 45 year old analysis which I made when I first learned to play the ending (the details of which are now hazy) but I'm inclined to think the analysis was flawed. In that case the percentage of draws should actually decrease as the board sizes increase. I think the biggest distiction we can make here is how many moves it will take to mate the king. There are plenty of evidences above that prove that it is possible to mate on almost an infinitely increasing board (assuming it stays a square not rectangular(for that i have no idea)) In a tornament there is a 50 move rule to prevent needlessly long games. It is possible to mate with this sinereo on a 8x8 board w/n the confines of 50 moves but with little room for error. 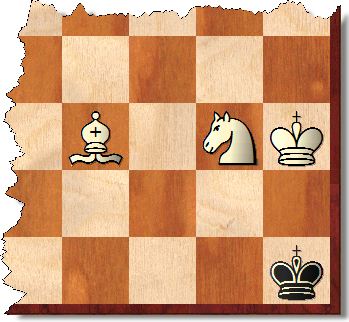 The bigger the board, the more space you need to corral the King into the corner which results in 90+ move mates. To summarize, As long as the board is square (Length=Width) then a KBN vs K mate is achievable. I cannot answer if the board is rectangular, someone else can answer that if they want or you could edit you question! Not the answer you're looking for? Browse other questions tagged endgame checkmate knights bishops elementary-mates or ask your own question. Is it possible to force checkmate with King, Knight, and Bishop vs. King? Is this endgame position a draw? Can this exchange-down endgame be explained succinctly? How to know when it is time to trade down to an endgame? Can a King and a Knight force stalemate against a lone King? What are some techniques for BvN endgames? Which pieces do I have to keep on the board, to win this endgame?